As a rule, I have an uneasy relationship with yarn-bombing. Done right and with purpose, yarn-bombing can be an effective way of practising craftivism (using craft as protest and promoting social change). It can transform a community and serve as a visual marker that something is not right. Sadly, I see too many press releases using yarn-bombing as a thoughtless exercise to "get the knitters on board" and throw a few pom poms at a tree as an empty PR exercise. But then there is this bench and I want to share its story with you. It is deeply affecting as well as a story of how yarn-bombing can be an incredible story-telling tool. This bench sits in a remote corner of the Botanic Gardens in Glasgow, Scotland. This particular bench is hidden away at the back, close to the rose garden and the 16th century garden. Most visitors never make it that far, but the location is a favourite spot for many local people. I live next door to the Botanics and you will often find me knitting somewhere in that little area when the weather's nice. Local textile artist and production designer Rita McGurn passed away two years ago, and her daughter decided to yarn-bomb the bench. Most of the benches in the Botanics bear small memorial plaques, but this bench needed to be slightly different as a tribute to a woman who was described as "colourful, eccentric and a little irreverent". Some of the pieces were crocheted by Rita herself before she passed away, while other pieces were made by Rita's friends and family. I came across the bench on a sunny day. As always, this corner of the Botanics was almost deserted - except people were lined up to look at this piece of art. A young couple was sitting on the bench for a long time, stroking the pieces of fabric and admiring the colour. A family stopped to have their children photographed ("no, don't touch the flowers - say cheese - no sit still - now look at me"). A small group of people stopped for a long time and I wondered to myself if they were friends of the family. As I saw more and more people stopped to engage with the bench - taking photographs, sitting down, touching it - I realised that they were drawn to it as an art piece. Some had read about the bench in local papers - others just came across it in passing. Everybody slowed down and took a moment to reflect. There is something so very moving about this yarn-bombing effort. It is a deliberate gesture carried out with care and love. The bench lights up its little corner of the park and the ephemeral nature of the piece makes it incredibly poignant. It is one of my favourite pieces of yarn-bombing I have ever come across. If you are nearby, I can only urge you to catch it before it disappears forever. You can read more about Rita and Rita's daughter, Mercedes here. Last week I went on a research trip to Yorkshire for my book, This Thing of Paper. It was the first of two research trips and I am glad that I scheduled it while we are still working on the patterns. The second trip will take place later this year and be less visually intensive but perfect for the essays. Thank you to everyone who has made this work possible. I had a profound experience when I travelled south to York, and I'm going to write more about that in a second. First, though, a very exciting announcement. I'll be teaching two workshops at the Yarnporium show in London this November. First, I'm running a half-day class on knitting hap shawls which covers the classic Shetland hap constructions, how to deal with lace charts, and how to work applied edges. I will also cover any questions on how to customise & design hap shawls. Then, I have developed a class especially for Yarnporium called Knitting the Landscape. This class is an exploration of psychogeography and knitting. We'll talk flaneuring, urban exploration, inner/outer landscapes, and how to express your own paths in knitted pieces that'll keep you warm on your journeys. I'm so honoured to be asked to teach a class like Knitting the Landscape - it's really a step outside what you'd expect from a knitting workshop and it gets us all thinking about what we can do with our everyday making. I like that. Now, back to my research trip. I spent part of my trip in York itself. The city was founded by the Romans, then became a major settlement for the Vikings, before growing into a significant religious site and wool trading centre in the 13th and 14th centuries. Much of York's city centre is well-preserved within the city walls (of which some date back to 300AD, but most to the 12th and 13th centuries) and the famous Shambles is a well-preserved medieval street. Between my appointments, I enjoyed walking around discovering small details here and there. We spent two days at the York Minster itself - one of the largest Gothic cathedrals in the world with various secondary buildings like a library and stonemason's court. The level of detail is astonishing: little mice carved into the stonework, gargoyles peeking out, statues with changed faces, elaborate cope chests, and the awe-inspiring architecture of the Chapter House (and its tiled floor). It was easy to spend hours here and we did. But what I did not expect was to have one profound moment that reduced me to tears. I don't know about you, but I've always loved stained glass. The deep, rich colours and the layers of allegorical imagery with so much religious and historical significance .. so when I saw York's Five Sisters window, I was taken aback. However, there was something different about the Five Sisters window. It is mostly composed of grisaille (grey) glass with just a few coloured pieces inserted here and there. Grisaille was made by painting patterns on pieces of silvery grey glass. The pieces were then arranged into intricate geometric patterns using lead to hold the pieces together. I speculated that the geometric patterns may have been influenced by crusaders seeing Islamic tiles on their travels (the timeline would be right, I believe). So I sat there beneath dark windows with strong geometric patterns and I had a strong emotional reaction. The window reminded me of the first time I read TS Eliot's The Waste Land which was also formed of 'fragments shored against these ruins'. Something about the small, insignificant pieces that swirled together in highly complex patterns to create something bigger than themselves. Small glimpses of colour and light to break the dark complexity .. the more I looked at the window, the more I cried. I later learned that Five Sister was last restored in the 1920s and dedicated as a memorial to the women who died during the First Word War. Mrs Little, a local woman, had a vision of long-lost sisters guiding her towards the window and as she approached, her sisters faded away to be replaced by five women sitting in a garden sewing needlework. I am moved by Mrs little's words: "After the war was over, when memorials on all sides were being erected to our brothers, I often thought that our sisters who also made the same sacrifice appeared to have been forgotten.” Names of more than 1400 women are inscribed on oak panels nearby. I sat there for nearly an hour underneath that window and I could have stayed much longer. Great art is what changes us and the way we look at the world. I never thought a 13th century grisaille window would affect me so but it did. Life is so much greater than just our own tiny selves. We combine to make sense of it all. Helen Lockhart of Ripples Crafts dyes exquisite yarns from her home in the Scottish Highlands. I first met Helen at a knitting conference when her stall was next to mine. We bonded immediately, so I cannot believe that it took us nearly five years to finally collaborate. We decided on our collaboration at In The Loop. I fell deeply in love with the blue-teal shade (Stormy Seas) and the rest followed. The rich magenta (Jewelled) and the warm grey (Assynt Peat) worked perfectly in unison. Working with her Quinag base was an absolute joy. The BFL gave Helen's colours additional depth and the yarn flowed through my fingers. The construction of Frances Herself will be familiar if you knitted my Byatt shawl (though it works in a slightly different way). You increase alongbthe top edge at an accelerated page which makes the shawl grow very rapidly in one direction and at a more considered pace in the other. It makes for wonderful asymmetry when worn - yet it is surprisingly straightforward to work. I do not believe in overcomplicating patterns when wonderful results can be achieved in a straightforward manner! A lot of the Frances Herself joy is derived from working with such wonderful handdyed yarns. Frances Macdonald McNair was a child of the Arts & Crafts movement and its truth to material ideas. Truth to material simply means that you take the material that is best suited to your project and you showcase it honestly. The shawl is designed to reflect that. I am a big fan of basic stitches (like stocking stitch and garter stitch) precisely because they let handdyed yarns take centre stage. Another modification you might like is beading. Frances Macdonald McNair used beads extensively - both as material and as visual metaphor. I opted not to add any (mostly as I was travelling when knitting my shawl and there is no worse combination than beads & a bumpy road) but it'd look incredible done right. If you want to add beads, I suggest doing it in the middle of the garter stitch sections with the beads nicely spaced out. I would also suggest choosing beads that reflects cols B and C - you do not have to agree! The shawl was knitted on 4.5mm needles which the beautiful 4ply yarn was more than capable of handling. I strongly urge you to swatch if you substitute with any other 4ply yarn (and also to check your yardage!). The open fabric has a lot of drape and character, yet it still retains a sense of itself. I love how the lace pattern blocked out - it looks like tiny tenement tiles which is so very apt for a pattern inspired by Arts & Crafts in Scotland. You can buy the pattern here. 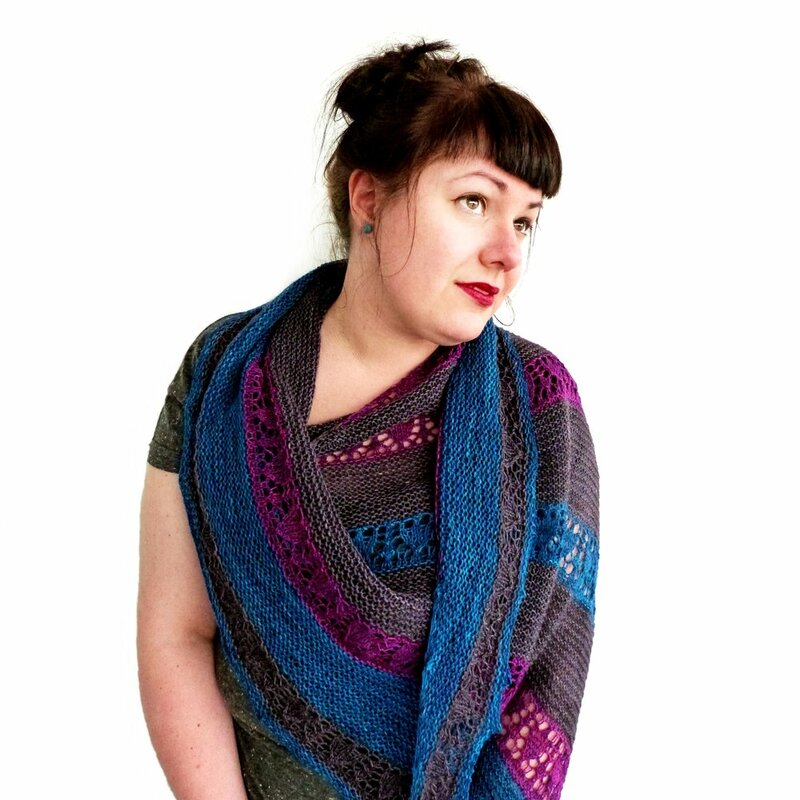 If you are going to Edinburgh Yarn Festival, make sure to check out Helen's stall where she'll be happy to advise on colour combinations (and we might have more up on our collective sleeve!). (Note: I am away from keyboard February 26-28 2016, so I'll get back to any queries as soon as I can afterwards). This is an image by Frances Macdonald McNair, a Glasgow-based artist at the turn of the century. Her art looks whimsical with sleeping princesses, fairies and gauzy dresses. In fact, her work is a lot more complicated when you look closer and she's the inspiration for my new shawl pattern. As part of my job I help other people figure out their pattern names. I usually have a wealth of names at my own disposal, but this time I am having trouble naming the pattern. This post is all about why. Frances was born in England and attended the prestigious Glasgow School of Art with her sister, Margaret. Frances and Margaret became part of a creative collective known as The Glasgow Four together with Charles Rennie Mackintosh and James Herbert McNair. Margaret married Charles; Frances married Herbert. While Charles went on to become an incredibly influential architect and collaborated extensively with his wife, the McNairs led an unhappy life. McNair's family had some financial misfortunes, he started drinking, and his career stalled. Frances suppressed her own career in order to help Herbert with his. She had his son, left the marriage briefly but returned before dying at the age of 48. Her husband destroyed most of her artwork after Frances' death. I went to see an exhibition on the McNairs about ten years ago. I was struck by how Frances was the much better artist of the two - her line work, sense of colour, and understanding of storytelling in art were all superior to her husband. I will be writing about her art tomorrow, but suffice to say I find Frances Macdonald McNair intensely interesting. She was an artist whose talent could not fully blossom because of her gender and the age in which she lived. If she had been born just a few decades later, perhaps her life story would have looked very different. She is deeply inspiring for many reasons - I'll share more tomorrow. Naming my pattern is hard. I want to honour Frances as the artist she was and could not be. I want to tell her story rather than a story in which she is relegated to being a wife or a sister-in-law of a celebrated man. Frances yields 77 pages of hits on Ravelry. I cannot name the pattern after the man who destroyed most of her art work. McNair is not even an option. I do not want to name the pattern Macdonald because not only does it mean the son of Donald but it also has a whiff of greasy chips. Glasgow Girl is an option. It was the name of a 1990 exhibition about the female artists flourishing in Glasgow at the turn of the 20th century (and is a nice counter to another Glasgow creative collective, The Glasgow Boys) but Frances only lived in Glasgow briefly. Frances used either very generic names for her art work (Spring; Autumn; Ophelia), deeply ironic names (Sleeping Princess), or amazingly angry names that are totally unsuitable (Man Makes the Beads of Life but Woman Must Thread Them). Photo of shawl by Dave Fraser. Imagery by Frances Macdonald McNair via WikiMedia Commons. Earlier this month the great-grandson of Post-impressionist painter Paul Gauguin passed away. It did not make headline news anywhere and I only found out via social media. The news upset me greatly. I grew up in a very rural part of Denmark. Prime farm country, most of life revolved around agricultural shows, travelling circuses coming to town, and the occasional dance at the local community hall. I was a bookish child and was a regular visitor to the local library. Books became my solace as I felt out of place - I read a lot of historical fiction and I made fanciful, historical outfits for my dolls. I was a lonely child. When I started 5th grade, Mr Clovis Gauguin was assigned as our art teacher. He had a large, unruly beard and wore colourful scarves. I had never seen anyone like him and his name was hard to pronounce. He began by declaring art classes should have soundtracks and for the next few years he played us everything from 1950s jazz to 1970s prog rock while we painted. Occasionally he'd urge us to bring our own tapes to class. And he'd show us art. His family connections made Post-impressionism the obvious place to start. We sat copying paintings by Georges Seurat, Vincent Van Gogh, and (my favourite) Paul Cezanne as well as Gramps Gauguin. Then Mr Gauguin asked us to paint in the styles of the painters we had studied and the paintings were displayed at school. My mum later told me that Mr Gauguin had pulled her aside to talk to her about me. I was going to stretch my wings one day, he told her. I did stretch my wings. I left my childhood community when I was 18 and moved to big cities doing things I could not have imagined as a lonely child stuck in the middle of nowhere. Thanks to social media, I reconnected with Mr Clovis Gauguin a few years ago and we had some fantastic conversations about art and music. I told him how much his encouragement had meant to me and he was delighted to hear that he had made a difference. The difference was this: Mr Gauguin showed me there was a world out there filled with art, beauty and truth. He taught me to express myself, to trust in myself and that life could be very different. While many of my passions can be traced back to the Friday afternoons we spent with Mr Gauguin (late 19th century art and early 20th century culture in particular - but also poetry, abstract art and cool jazz), it is very possible I would have discovered these things in my library books. But I would not have known that I had colours and words inside me. Another way of life was suddenly possible thanks to my art teacher. On the day of his funeral, Mr Gauguin's Facebook feed was filled with stories shared by people all over the world. Unsurprisingly I was not the only one who had benefited from his joie de vivre, his passion, and his encouragement. Concert videos from a restaurateur in the Southern United States who had once hosted Mr Gauguin's jazz band; Tahitian relatives sharing memories of drinking beer with Mr Gauguin outside a memorial service for his great-grandfather ("Paul hated the church, so in his honour.."); but mostly stories similar to mine. So many people writing about discovering a big, big world - both within and outwith themselves. I cried when I heard Mr Gauguin had passed away, but he left his mark on the world by inspiring and nurturing people whenever and wherever. Sometimes you do not need to generate headlines to be a big, important person. And he really was such a person to me. If you listened to my interview on the Knit British podcast, you will already have heard about my future .. er, non-collection plans. Unlike Doggerland, the Authors & Artists series isn't going to be collected in one place and it won't have a coherent colour scheme or design vocabulary. I reserve all that for things to come (and things are in the pipeline). No, the Authors & Artists series going to be slightly more playful and anarchic. I'll be playing with beautiful yarns, having fun with small, quirky ideas, and the patterns will be released when they happen. No sign-ups, no massive thing to pre-order. We are going to play this by ear as I spend some time getting the Next Big Endeavour ready. Authors and Artists is what it says on the tin. I love books and I love art. Every day I am inspired by something I see in a gallery or read in a book. The patterns are going to be inspired by people who make the world seem a much richer place just through sharing their own creative impulses. I'll be designing accessories of various kinds and probably also dip into some garments. It's going to be an adventure fuelled by tea, books, and art. If you feel like it, feel free to read some books or look at some artwork - but it is not a requirement. I hope you'll join me one way or another. The first pattern will be released this month!